Naturally rich in fatty acids and vitamin E, coconut milk soap makes a great moisturizing bar that can actually clean your skin. This soap is good for those with sensitive skin. The first 2 pics are from the Coconut Cucumber Soap. I added a pinch of wild tussah silk to give this soap a luxurious silky/slippery feel to it. The last pic is a Coconut Milk Soap, Fragrance Free. Some great info from the Doctor OZ site that answers many questions i get asked about soap. I'm going to concentrate on glycerin soap today since i get so many questions about it. A few things that i would add about glycerin soap, it makes a great natural cleanser that moisturizing the skin. Glycerin naturally draws moisture from the air to your skin, this is why i have to wrap glycerin soap in plastic. All soap i make naturally contains glycerin, in the pic below, you can see the glycerin pooling on the top of the soap as it heats up in the crook pot, the stick blender mixes it back into the soap as it cooks. Before the chemical age we now live in, this was how soap was made. Today unfortunately many big soap manufacturers remove the glycerin so they can use it more expensive products like beauty creams and lotions. So if all soap i make contains glycerin, what is glycerin soap? All real soap = glycerin soap, but the term "Glycerin Soap" generally refers to soap that has been superfatted with glycerin. Supperfatting is adding extra oil (or in this case glycerin) to soap at the end that won't be saponified (converted to soap). I will go into greater detail about supeffating and saponification when i get around to posting some tutorials about soap making. Sugar scrubs are a gentle natural way to improve the texture of the skin, and unlike salt scrubs, they do not dry out your skin. Sugar produces Glycolic acid, an alpha hydroxy acid that naturally exfoliate your skin. It works hard to loosen dirt and dead skin cells for easy removal. Caution: Cinnamon Bark Essential Oil can be irritating to the skin of some people. Those with sensitive skin should test the product on a small patch of skin first. A luxurious all natural lip balm. No artificial scents and flavours, and 100% chemical free. Rich in vitamins, nutrients and essential fatty acids that nourish and protect your lips. More than just a candle, made with a special blend of skin nourishing ingredients that melts at a low enough temperature to provide a nice warm massage. Made with all natural ingredients, long lasting all natural fragrance will fill the air and linger on the skin. 40-45 hour burn time, if using only as a aromatherapy candle. To use your massage candle, light the candle and wait for the wax to pool. Then either pour the melted wax into your hand or straight onto the skin. If that's too hot for you (or your partner) blow out the candle and let it sit for a minute or two, then pour or scoop the warm wax into your hand and use from there. You can use as much or as little of the candle as you want. 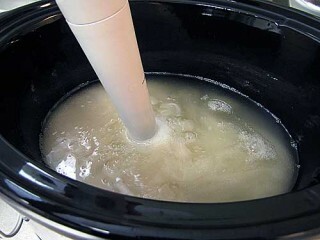 Any pooled wax you don't use will re-harden so you can melt it again next time. Yay!